Everyone knows that eyebrows are big news. They're basically the 'in thing' when it comes to makeup right now, and if your brows aren't 'on fleek' (I cringe whilst typing this) then you're only letting your face down. There has definitely been lots of hype surrounding eyebrows over the last few years and it definitely doesn't look like it's about to slow down, so I thought it was about time I popped up a post on some of the brow products I've been trying recently. Believe it or not, I've never actually been and had my brows done professionally. I'm hoping to get my brows HD'd at long last soon (totes upping my 'brow game'), but I've got by the past 10 years doing them myself, only over-plucking them once and immediately regretting it (we all did it though, right?) Now I tend to let them be, only tidying up every now and again, and I let the makeup products do the talking when it comes to keeping them looking good. I think the first brow product I ever used was Rimmel's Brow Pencil, and since then I've discovered the joys of powders and even fibre lash products. As great as pencils are, when it comes to the new wave of eyebrow, you need to use a powder if you really want the wow factor. One of my all-time favourite brow powders is actually the HD Brow Powder, which I tried a few years ago after receiving it in a beauty subscription box. At the moment, however, I'm flitting between Benefit's Brow Zings* and my Hi Impact Brow Palette*. Both products are pretty similar - they feature powders which are super soft and blend seamlessly into the eyebrows, filling in gaps and giving that full, defined brow look. The difference between them, however, is that the Benefit offering comes in a selection of different shades, along with a wax, brushes and a mini pair of tweezers, whereas the Hi Impact palette comes in a palette featuring a brush and four different shades, which can be used to fill your brows as well as an eye liner or eye shadows. The Hi Impact palette is designed so that you can find the perfect shade for your brows - by mixing powders - but I found the first shade to be the perfect colour for me anyway. I'm yet to try the black as an eyeliner or any of the shades as shadows (they're not my usual cup of tea eyeshadow wise) but judging from the shade I use on my brows I'm guessing they're pretty soft and blendable too. If more of a natural look is your thing, then there are a couple of products that might be for you. Another Benefit product, Gimme Brow* is a 'brow-volumising powder gel' that comes in two shades (light/medium and medium/deep) and is quick and easy to brush on, adding fibre to the brow to give a full but natural brow look. Another product worth mentioning for natural brow lovers is Silk Fibre Brow Enhancer*. Similarly to Gimme Brow, it adds fibres to the brows to give a natural filled in look. Unfortunately I didn't get on too well with this product and would say Gimme Brow is definitely the superior of the two - I think because the Silk Fibre Brow is powder it can be quite messy to apply and really doesn't hold as well. 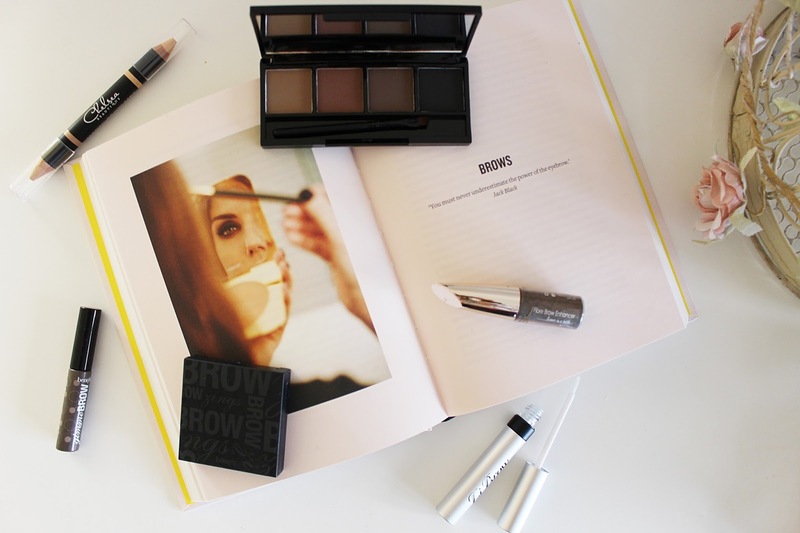 If your brows are on the thin or very light side and you want to thicken them up whilst darkening them, then LiBrow Serum* is definitely worth trying. This serum conditions your brow follicles while tinting and darkening your brow hair, to give you fuller and more defined brows. Since using it my brow condition has definitely improved, and the added tint is great if you have fair brows. Finally, if you really want to up your brow game, then you need the Magic Brow Lift* from Chelsea Beautique. This concealer and highlighter duo-pencil is ideal for perfecting your brows. The concealer gets rid of any imperfections whilst brightening the eyes and the highlighter defines and lifts the brow bone, to create the ultimate wow-brow. I've really enjoyed using this and it's definitely helped to define my brows more and make them look lifted. I've never come across a product like it before but would thoroughly recommend it if you're all about the brows! Phew... so there you go, my pick of the brow products I've been trying lately to give you the perfect eyebrows. Let me know what your favourite brow products are!